Kenya/East Africa’s had it’s share now, with the popularity, scale and ripple effect growing with each one. The past few good Twitter trending topics include #AVitzIsNotACar (A Vitz is not a car) which made it into the blogosphere on Al Kags’ blog and even garnered an official response from Toyota Kenya. Then there was #MWEA10 (but we’re still debating whether this counts because it was a conference, not a by-the-people-for-the-people kind of Trending Topic), and iAlen‘s #YouknowYouAreKenyan was another good one, but thanks to the you’re/your/you are dilemma, didn’t really archive well. Lazizi: #kenyainthe90s weather forecast by the 1 n only, Ngwata francis. TheMacharia: #Kenyainthe90s Blueband Quiz show. I was on that show, and we won! Tininai: #kenyainthe90s the doubledecker buses at bus station. MoSande: #kenyainthe90s I went to Montecarlo, Hollywood and Vibestar once! lyssawambui: #kenyainthe90s when u cud go 2 Uhuru Park with kenchic or city park 2 c th monkeys made mst of th sundays. matrixster: #kenyainthe90s kids used to wear shorts to school. Nowadays even kindergartens wear long pants. Even Sunshine Secondary! itsKwambox: #Kenyainthe90s Fred Obachi Machoka and the show is Music time…Rear watts the masai dancerz wer the starz! mwanikih: RT: @nzilani: #kenyainthe90s those ink pens you had to refill < OMG! Haha! And they were so messy. Used Quail Ink! jusBlackman: #kenyainthe90s Maembe pilo, Kashata, Cool (Ice) mabuyu..
missmacharia: #kenyainthe90s kass kass, rastrut, and jam jimmy jam jam-a-delic! wanyax: #kenyainthe90s red GreatWall TVs with a rainbow coloured film to convert them “from black-and-white to colour”! mwanikih: #kenyainthe90s Playing cards using the Maziwa ya Nyayo cut outs. They had, Boxing, Football and Netball cards! That’s probably not even the best of it all, but just a taste. Here are some of the videos being shared during the trending topic, bound to bring a chuckle or two. What’s your favourite memory of Kenya in the ’90s? I’m one of the curators of TEDxNairobi and though I wasn’t in attendance at the inaugural event (was busy working on my first film – Dawa <– Follow them on Twitter!) I was able to do the awesome planning with the great members of the Dream Team – Joshua, Phares, Sheila, Soud, Kim and Lina. If you’re unfamiliar with TED and their independently organised events have a look-see below. TEDx was created in the spirit of TED‘s mission, “ideas worth spreading.” The program is designed to give communities, organizations and individuals the opportunity to stimulate dialogue through TED-like experiences at the local level. At TEDx events, unique talks given by live speakers combine with TEDTalks videos to spark deep conversation and connections. TEDx events are fully planned and coordinated independently, on a community-by-community basis. A self-confessed tree hugger, Paula Kahumbu opened by reminding us how extraordinarily privileged Kenya is as a country as far as diversity is concerned, and how most times, it’s taken for granted by Kenyans themselves. By demonstration when she asked to see those in the crowd who had been to a National Park in the last month, only a handful inferred to the affirmative. It brought life to her statement! She shared on how Kenya has one of the world’s largest diversities of bees – over 1500 species. Make sure you have a look, and a special thanks to WildlifeDirect‘s Baraza for sharing it on their blog too. 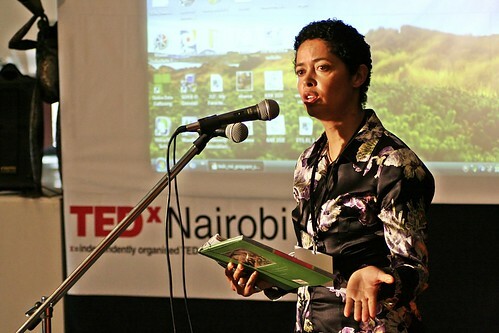 If you’d like to know more about TEDxNairobi have a look at the posts on all their Speakers. Amazing list with the likes of Aly Khan Satchu, Boniface Mwangi, Kwame Nyongo and Tonee Ndungu and Nyokabi Musila. You can always follow my TEDxNairobi Twitter list here. Don’t forget to stay in the loop on the next TEDxNairobi! Fan them on Facebook and Follow TEDxNairobi on Twitter. Last week, Larry Madowo – Business Anchor for KTN, sent out a tweet to his followers on who to bring to KTN’s Sunrise Live show the following morning to talk about Social Media. The said person would accompany Kenyan Twitter Rockstar and techpreneur (not to mention, good friend of mine) Kahenya Kamunyu. Thanks to the likes of Teddy and many other people on Twitter, I was recommended and got Larry’s call later that evening. I was both humbled and very grateful for those who put in the good word from me, and I hope I did them justice in the interview, of which is an excerpt below via Kahenya. 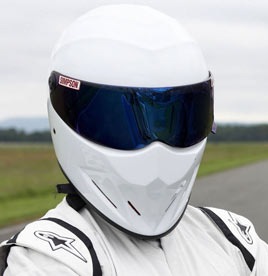 Others claim that his blood type is ‘Unleaded’ and if you tune in to the 1245 MW Frequency, you can hear his thoughts…All we know is that he’s called The Stig. It was a conspicuously sunny Nairobi afternoon, as @mkaigwa (known from here on out as TheRealStig) walked around in his ‘Oval Office’ pacing the length of the room searching for a corner. He was also pondering all things horse-trading, flea-markets and lampshades. In the midst of his thunderous brainstorm, from the comfort of his umbrella, he sent out a tweet. A tweet that would change the face of the Tweetmosphere…forever. One of the greatest revelations to a modern mystery that has baffled millions of car enthusiasts the world over. 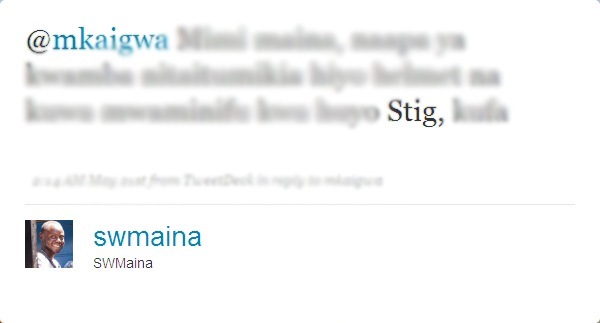 He exposed, that He indeed was…The Stig. Simple it was. A statement that was true, fair and just (all three words in the Kenyan context). But not so. For soon after this tweet was hurriedly placed behind a cursor and sent at lightening speed through the interwebs to appear to some +350 followers, there would be trouble in paradise. Meanwhile in a dreary and drizzly London, from a pro-Arsenal cafe, sat @Shaun_g, also known as ‘Leader of the Resistance’ or LoR. As pulses of Arsenal-blood flowed through his body to his fingers, Shaun_G was also to send out a tweet that would shake the foundations of the Twitterverse. 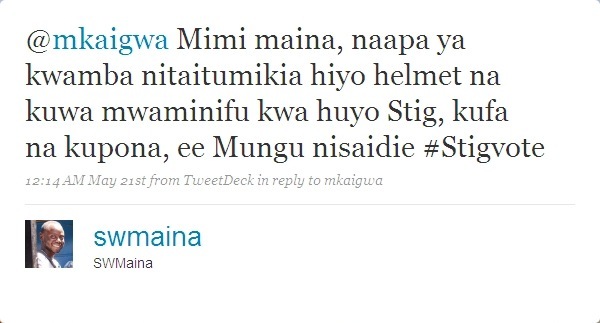 He challenged @mkaigwa and claimed HE was The Stig. It left @mkaigwa disturbed. He paced up and down the halls, with great unease. This prompted him to seek the counsel of one of his wise men. Having been challenged, and the masses being told of this farcical reality, it was the wise words of @alfredmutua that prompted @mkaigwa to find a democratic view to resolving matters. 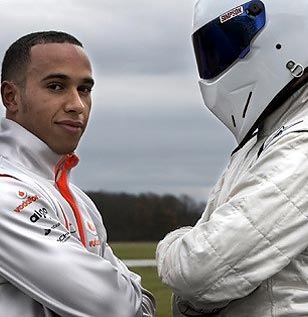 It was to be decided, who indeed is The Stig. By means of a vote. 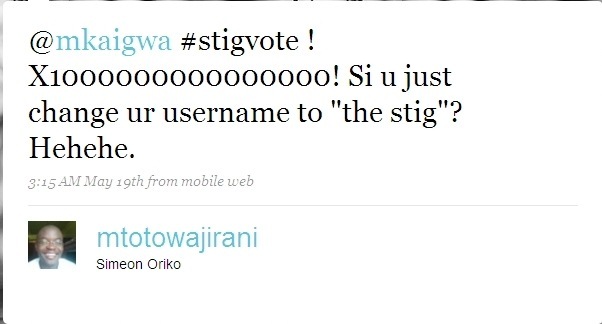 Not just any vote, but #StigVote. And they were off. 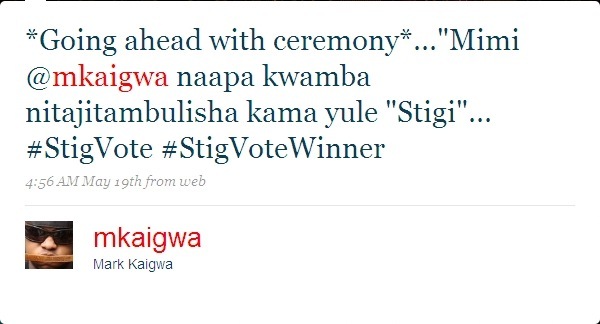 @mkaigwa began the lobbying for his election (and appropriate renaming) as “The Democratically Elected, People Chosen, Fairly Voted Stig” or TDEPCFVS for short. It wouldn’t be easy, @Shaun_G was prepared, he was poised, and with his international credentials, looked set to mount serious challenge to the incumbent @mkaigwa. The campaign styles were simple. Get people on Twitter to ‘vote’ for whichever candidate they felt best represented them. Some chose not to vote, others chose to vote either both ways, but there was soon to be a twist. Watching from his lair, deep in the labyrinth beneath Nairobi (Also known as E-dust-real area). Unbeknownst to the common man, was the coy @intelligensia. At this point, #Stigvote was looking like a two-horse race, a good-old Obama-McCain or an Ali-Foreman. But @intelligensia was having none of it. Needless to say, a large 6 foot tall spanner was tossed into the election and it became a three-legged horse race for the official Twitter Title of TDEPCFVS. This battle, it seemed, was to be won and lost deep in the servers and networks of the interwebs. It was a level playing ground, and @mkaigwa was pulling out all the stops to make sure he would be fairly re-elected. His campaign manager @louizah sent out the word, and was quick to persuade the masses on who to pick. But it was close, @Shaun_G and @intelligensia had soon caught up to @mkaigwa’s supposed lead, and things looked like they would go down to the wire. Supporters were tense, and this soon showed as ‘deals’ began being struck left, right and centre. The @mkaigwa camp stood its ground as it slipped into last place as @Shaun_G and @intelligensia struck deals in high places with Kenya’s Twitterati. It started off innocently with @swmaina asking if anyone had something for him to eat, but the events that followed shook the walls of twitter integrity for years to come. It soon became apparent that @swmaina was not looking for anything edible. The Society of Blogs for Better Tweets (or SoBleets) has reserved the right to show this tweets contents. It all went downhill from there, from open e-bribes to cookies, milk and drinks of a markedly higher potency being promised in return for vote. It must be said, however, that @Shaun_G did excellent in this arena, covering his tracks by going to DM Status (The equivalent of door-to-door Marketing) His strategy would soon pay off, as @intelligensia’s house of cards came tumbling down. Messages like this were soon appearing on screens across the world. @intelligensia tried to throw the heat off him and his ‘Electioneering team’ He would soon bite his words, as @swmaina would soon make a confession meant to build @intelligensia’s campaign and give it credibility that hurt @intelligensia’s public image. @Swmaina had confessed to being bought, and was going to use his spare vote (Granted to him on a Stig Pardon by @mkaigwa) to re-vote. This would lead to a Delegation of a Team of Experts of Prominent Persons Enlisted on a Shortlist or DATEPPES being sent to investigate. But @intelligensia’s light in the race, was fast disappearing. 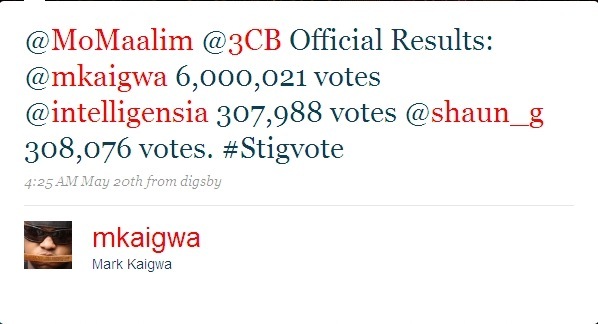 @Shaun_G had overtaken him in the polls, and @mkaigwa held his slender lead. 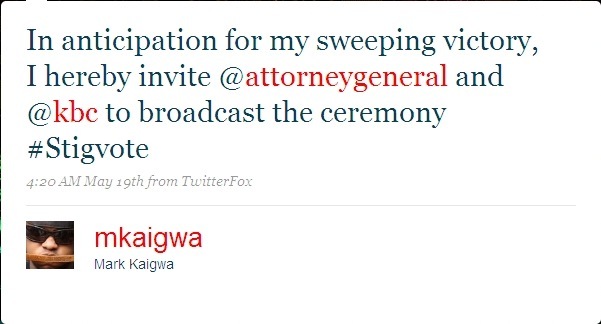 @mkaigwa was hard-pressed by events. Instead of chasing after votes, he sought clout, one vote that would change all votes. @mkaigwa won @mamajunkyard’s vote and in a change of events (just like when Obama landed a big State and got more points in the Electoral College) He was in the lead again. There was also the great support of key individuals in Mark’s party. A Timeline was quickly set to 2 PM CAT and as the clock ticked slowly, sweaty fingers typed on keyboards Africa-wide and worldwide urging the masses to vote. In every election, there are ‘spoilers’ @intelligensia is a spoiler, since this was a two-horse race, but he can be classified as an official spoiler. A last mid-election appearance on the ballot papers was @schunga who sought to clarify some issues. The Race from here on out, defines words, and can only be described with….Tweets. The Swearing in Ceremony had started, and it seems while others were being sworn in as Helmet Secretary, others began protesting the outcome. But it seemed the decision was final, and though it was a close race, The Winner had been decided. 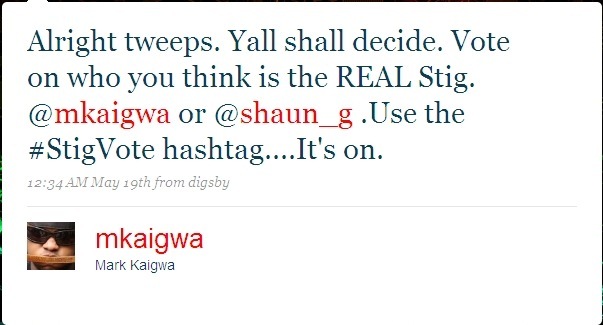 Oh, well…You win some you lose some…That’s a #Stigvote for you.